This is short manual to guide you through setting up Systematic. Give your organisation a name. Enter your business address. This will appear on emails you send via Systematic. The Sites section is where you set up sites (business premises) and stations (sections or work areas within a site). Enter a business name. This is the name of the business at the site, e.g. “Al’s Cafe”. Sites will all be shown grouped under their business name. Site name: e.g. “Norwood” for the cafe at Norwood. Short name: a short name for the site, e.g. “NWD”. 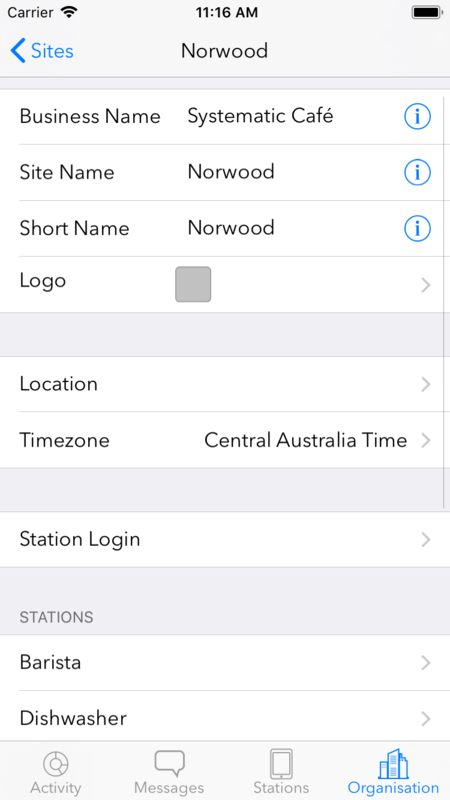 This name is used to distinguish stations with the same name across sites. So you if have several “Kitchen” stations at different sites, Systematic shows them as, e.g., “Kitchen (NWD)”, “Kitchen (DLW)”, etc. Logo (optional). You can set a logo per site that will replace the organisation-wide default logo. We recommend a square logo, at least 180x180 pixels. Location: set a location on the map for the site. This also sets the time zone for the site, which is important for scheduling tasks and notices at the right local time for the site (you can also set the time zone manually if you wish). Tap the ‘Add Station’ button. Station name: a name for the station, usually named after the kind of work done at the station, e.g. Kitchen, Service, Warehouse, etc. Add any other stations that you want to set up for the site. 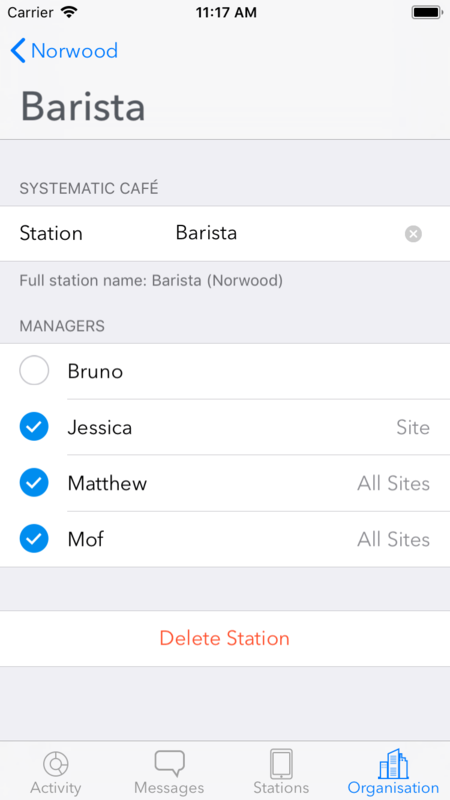 The Systematic app runs on iPad’s at the site and displays the tasks, forms, notices, etc for the stations at the site. You can have a device per station, or a single device per site and switch between stations on that device. 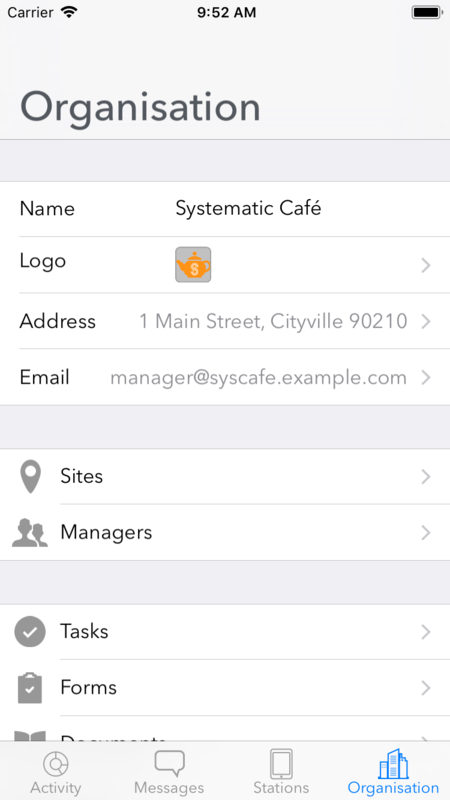 Systematic will also run on iPhone/iPod Touch. 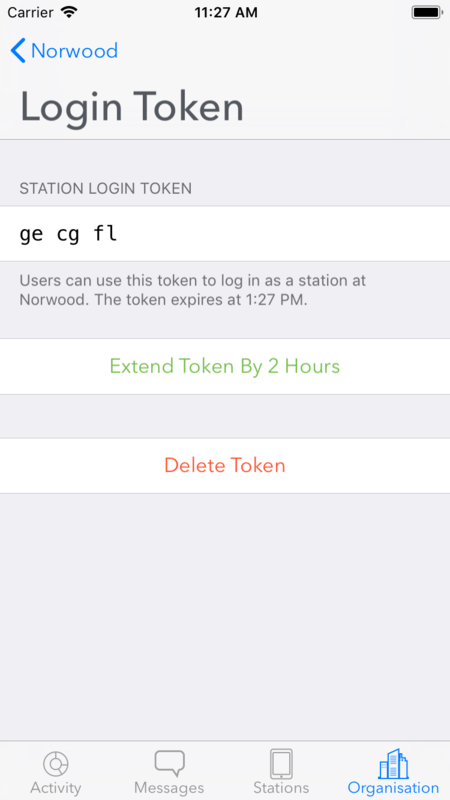 Before installing Systematic at a station, issue a login token (a temporary password) for the site. To issue a token: select the ‘Organisation’ tab, select ‘Sites’, select the site you want to log the station(s) into, then ‘Station Login’. Tap ‘Issue Token’ and write down the 6-digit token that appears. Download the Systematic app from the App Store onto the device you want to use. When prompted for a login token by Systematic, enter the token you issued. If you have more than one station at the site, you will then be prompted to select the initial station to show. Done! You have a station connected. Systematic has a range of features, and what you want to set up next will depend on your business. Select the ‘Organisation’ section at the bottom of the screen, and you’ll see the things you can assign to your stations: Tasks, Forms, Documents, Notices.